Retail rents have surged in Times Square, Fifth Avenue and Soho and have exaggerated the strength of the overall retail market. Retail rents on Fifth Avenue in the 50's are as much as $5,500 per square foot for 3,000-square-foot space at 730 Fifth Avenue which is 50 times higher than some spaces a few blocks away. There was an astonishing $70 billion in property sales slated for completion by the end of this year, 2015. The $70 billion figure would represent a 12.5 increase from the city's previous record dollar volume in 2007, including a 2.6 billion acquisition of 11 Madison Avenue, Norwegian bank Norges' $1.6 billion purchase of a stake in Trinity Church's Downtown office portfolio and French insurer AXA's sale of two Midtown office towers, 1285 Sixth Avenue and 787 Seventh Avenue, for more than $3.5 billion. Manhattan office leasing activity was considerably lower than its five-year monthly average. Manhattan asking office rents are up 12% year-over-year to $73.81 per square foot. Leasing activity remained steady with 2.8 million square feet leased during November. Midtown Manhattan was the most expensive office market and 10th most expensive in the world, with occupancy costs of $127 per square foot. Downtown Manhattanwas the 24th priciest office market in the worldwith occupancy costs of $86.36 per square foot. Downtown is the sixth most expensive office in the U.S. The most expensive hotel dealChinese insurer Anbang's $2 billion acquisition of the Waldorf Astoria was completed in 2015. Midtown saw 1.06 million square feet of leasing activity, 19% below the five-year average of 1.31 million square feet. Leasing activity for the year-to-date, however, was up 7% from the first 11 months of last year at 16.23 million square feet. WeWork rented 110,000-square-foot at 300 Park Avenue. Average asking rent of $78.62 per square foot in Midtown was up 6% from November 2014. Times Square South district was at a high of $58.37 per square foot. Midtown South is also seeing a slowdown in leasing activity. Midtown south office market continues to get tighter, with a 4.8% vacancy rate down from 5% vacancy a year ago. Average asking rents of $70.80 per square foot in November were almost unchanged from October but up 5% from $67.28 per square foot in November 2014. In Downtown, 311,000 square feet of leases were signed 32% below the five-year average of 455,000 square feet, with year-to-date leasing activity of 4 million square feet, a 37%decrease from nearly 6.4 million square feet the same period last year. Teachers' Retirement System of the City of New York signed a 191,000-square-foot renewal and expansion at 55 Water Street. Both availability and vacancy rates increased slightly from a year ago to 9.2% and 12.1%, respectively with average asking rent of $56.36 per square foot jumped by 10% from $51.41 per square foot in November 2014. TAMI tenants, including tech startups and media companies,are increasingly driving the city's office market to move towards prewar buildings, and it's meant some side-street Flatiron District buildings are garnering higher rents than larger, more available Penn Plaza properties. Midtown Manhattan's Third Avenue stretch is in the middle of a resurgence with vacancies low and rents steadily climbing. Class A asking rents on Third Avenue are up to $64.20 per square foot in the third quarter, up from $60.71 in the second quarter. Overall rents, including Class A and Class B properties, have climbed to $61.25 per square foot after years in the $50s. The overall vacancy rate in the submarket dropped to 7.1%, a significant drop from the 11.1% rate at the end of 2014 and 14.4% in the first quarter of 2013. 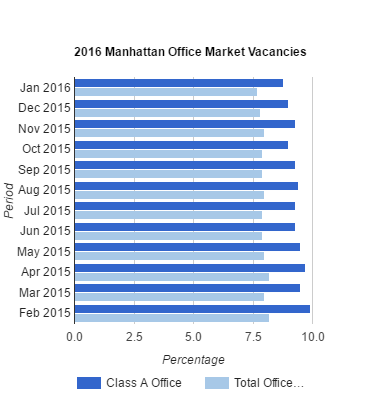 The Class A office vacancy rate is around 6.9%. New York's investment sales market continued to soar in 2015, bolstered by an enthusiastic lending environment. While many of the biggest loans made were for trophy acquisitions, it was also a year for refinancing.